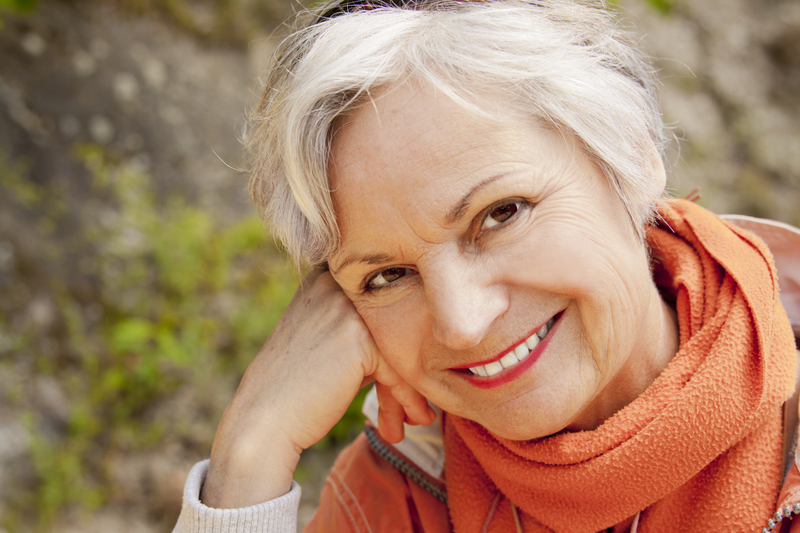 The BC Center for Elderly Advocacy & Support is a provincial wide nonprofit organization that helps seniors with financial, legal, physical and emotional abuse issues. One main service is a senior support call-in service called SAIL (Seniors Abuse and Information Line). Financial abuse, legal abuse, abuse of seniors rights and other issues are handled daily by the volunteers and staff at the organization. The service is in demand as our senior’s population continues to grow as the Boomer generation moves into retirement. The Province’s support services for the elderly are inadequate and accessibility to these services is suffering. 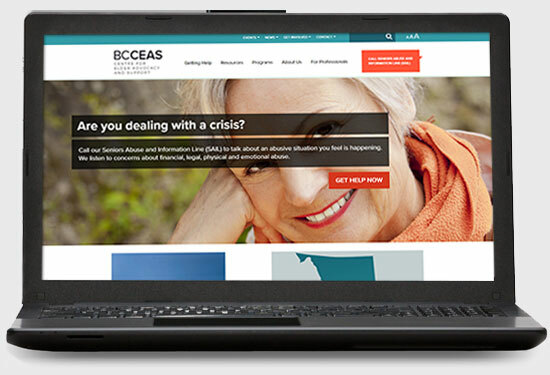 The new website for BCCEAS is in response to the organization’s desire to share their services across the province and educate those in the care, legal and seniors support services and on how to best assist seniors in abusive situations. While the Centre is actively managing a wide range of services for the elderly, the awareness in the province about their services was not at the level it should be. The previous website was outdated and poorly organized with a huge list of broken links and dead end navigation. 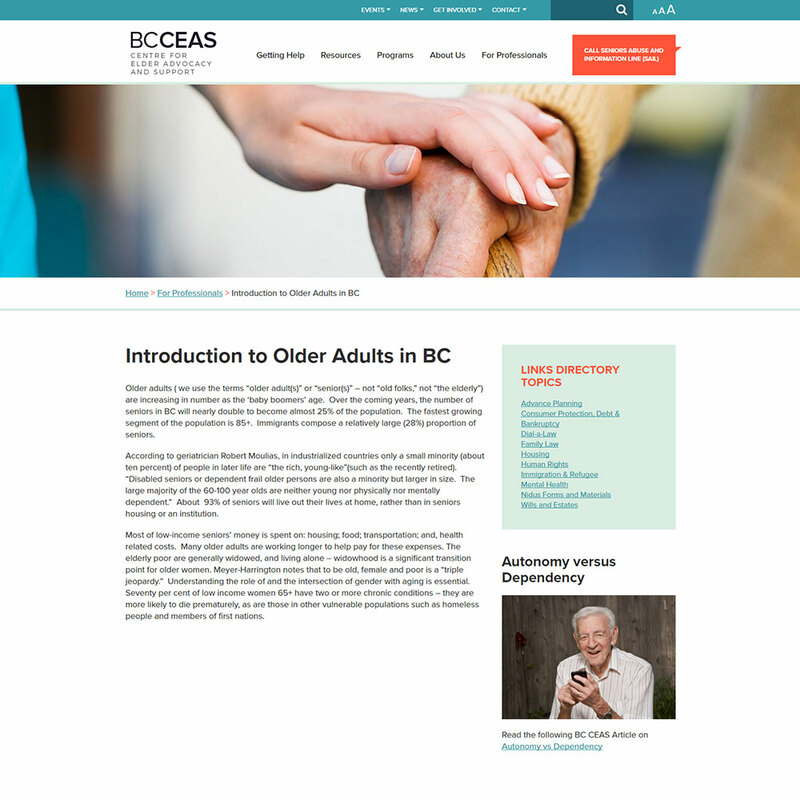 The challenge was to create a new website that reorganized the content into logical silos of information and redesign a mobile friendly site that was easy for Seniors to use and effective at promoting their message across the province. Spincaster had to start fresh for BCCEAS and engage the stakeholders of the project to define what was important to their needs and the needs of their users. We found that many items had changed over the years and were poorly positioned on the old website. Many blog and news items were actually content that should have existed as pages and appear in the primary navigation. The sites poor structure lead to the misuse of the tools in WordPress to properly present site content. After the stakeholder interviews, we set out a list of priorities for both the content needs and the user experience needs. Then we got to work on reconfiguring the content around a new framework that simplified the flow based on the user types visiting the site. The result had items in the right place, in the right priority and with a new series of clear and concise calls to action. The final solution also took into consideration the design needs we had for a user group that was often over 60 years old. 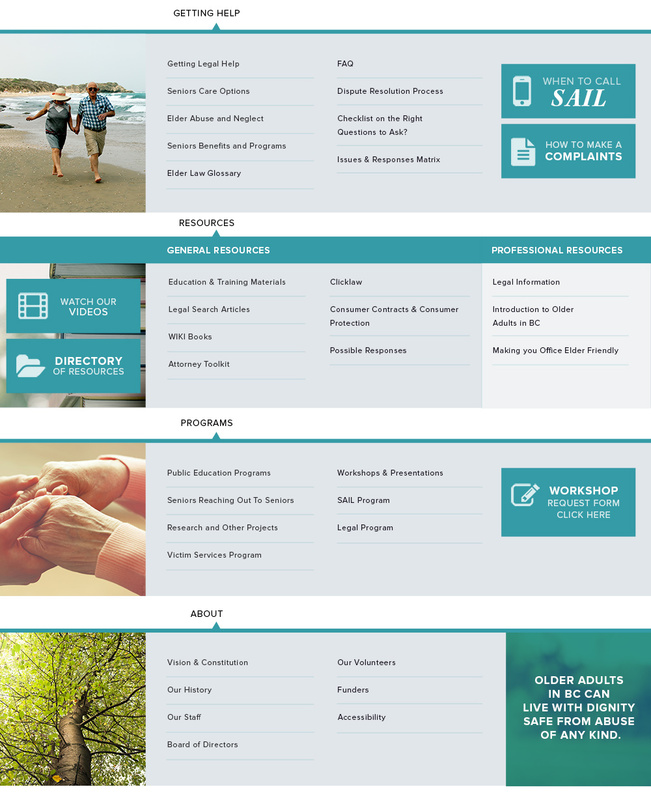 Web standards were followed to ensure readability, design choices and technical items to match the needs of seniors. Of course, we also wanted to create a positive experience as many of the users coming to the site are in very stressful situations. This influenced the choice of colors and photography to help support the new theme for the site. The new website features a clean design, logical navigation, new editorial tools, media features, new site index & structure and a more heartfelt brand for the organization. The result is a solution that now projects strongly across all areas of the province and helps build awareness for their much-needed services. The updated WordPress framework has also eased the administration of the site by their volunteers and staff.